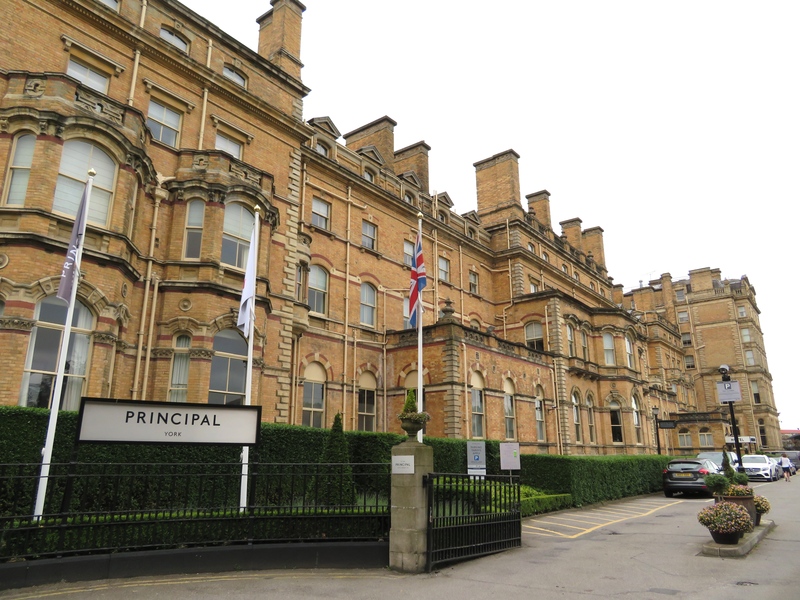 Located across the road from York train station as well as a short walk from the city centre, The Principal Hotel is the perfect hotel for anyone visiting York. As you walk in to the hotel you feel like you are walking in to a stately home. Upon arriving at reception I was immediately welcomed to the hotel where as I checked in I was told that I’d been upgraded from a double deluxe room to a junior suite. My room was both spacious and bright, out of the various hotels that I’ve stayed in I found this room to be the first room to have made me feel at home whilst at a hotel. There were little touches in the room that made this hotel special for making you feel both welcome and comfortable. In the room there was a mini fridge containing complimentary still and sparkling water as well as a small bottle of semi-skimmed milk which was perfect for using when making coffee or tea. The Principal hotel is also unique in offering a tuck box in your room which is complimentary, as it contains snacks such as biscuits or crisps. The bathroom was a favourite of mine in the room as it was a decent size compared to what some bathrooms can be like at other hotels. There was marble on the floor and walls as well as a large mirror on the wall and heated radiator. The bathroom included a large walk in shower with a rainfall shower head. Elemis toiletries are provided in the bathroom. My favourite thing about the room was the bed as I had a super king sized bed which I found to be the comfiest bed I’ve slept in. I found this bed to be better than my own bed at home and would’ve gladly taken the bed home with me. If you take an iPad or tablet there is the chance to download over 60 newspapers and magazines at no extra charge. Depending on the location of your room there is a chance you could have a view of the gardens and York Minster which is a view that I had from the room. At The Principal they offer a Twilight Tea which is an alternative to Afternoon Tea available from 5pm to 8pm in the Garden Room. I would recommend going for Twilight Tea where you can enjoy either a bramble cocktail or virgin blueberry mojito, I went for the bramble cocktail which comes in a small glass as well as a glass teapot. With your cocktail you can enjoy some finger sandwiches, warm homemade scones with jam and clotted cream as well as a selection of mini cakes. If in the evening you wish to go for a drink you are able to by going to the bar located downstairs with a games room attached. At the bar you are able to choose a drink from a selection of cocktails, spirits, beers and soft drinks. I opted for a Sloe Royale which included sloe gin and champagne, this is a drink I would recommend. In the games room which is separate but you can sit in whilst enjoying your drink you will find table football as well as some board games. You are able to find little seating areas located around the hotel where you are able to relax whilst sitting in some comfortable chairs. For my stay breakfast was included as you go to the Refectory which is a dining area featuring indoor plants. There is a good choice of food as you can choose from having a full English breakfast, cereal or pastries/ muffin. I chose to have some bacon, sausage and beans as well as a lemon and poppy seed muffin which was all delicious. The Principal Hotel is one that I would definitely recommend as well as one I would return to. My stay at The Principal Hotel was provided in return for this review, all photos and views are my own.